I made this card for the Clean & Simple stamping blog challenge and this time the challenge is a sketch challenge. This card went together so quickly and I love the way it turned out. Below is a photo of the sketch we were to follow. 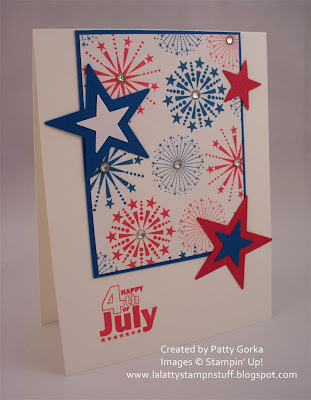 I also made my card for the Stamptacular Sunday Challenge blog which was to create a red, white, and blue card with some sparkle and for the Paper Playtime blog challenge which was to create a card using red, white, and blue with a die cut. I used a retired Stampin' Up! stamp set called 'July Fourth' and there are fireworks stamps within this set and I used those stamps to randomly stamp all over my background using real red and pacific point ink. It might be a little hard to see in my photo, but I added a rhinestone jewel in the cneter of all the fireworks. 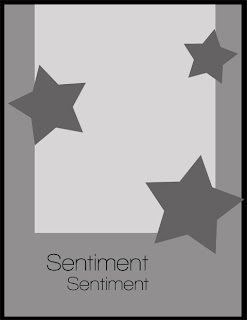 My die cuts are my large and small stars. Thank you so much for taking the time to visit my blog and leave a comment for me. I would love to have you become a follower! Have a great rest of the day! Great job on this sketch challenge, loving the stars and fire works. I love this card Patty....I have this stamp set and I need to use it now. Thanks for sharing. Awesome card girly! I love it! 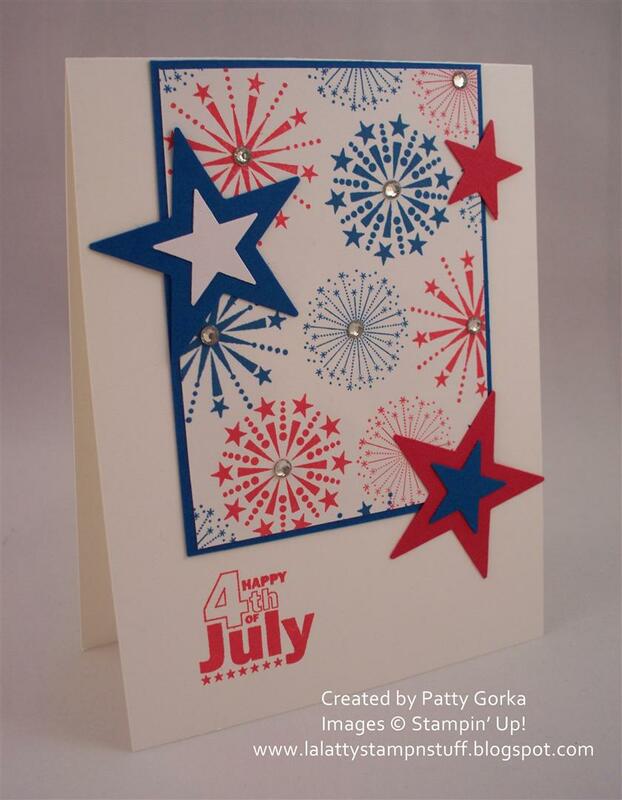 Another great card for the 4th! Sweet layout too! What a great job you did! Thanks for playing with us at Paper Playtime! :) Janis P.S. I'd love you to play over at my other challenge blog, Pause Dream Enjoy Challenges, where there's a new challenge every Friday! Oh wow. That's a great card for the sketch. Love it! gorgeous work hun! I LOVE fireworks!! Thanks so much for playing along @ Paper Playtime!